Have you decided to start your own ethnic site for small communities in foreign countries? We can help you accomplish that. KVO STAVA? — the largest portal for Bulgarians abroad. Since its launch two years ago, KVO STAVA has attracted nearly 50,000 registered profiles of Bulgarians living beyond the borders of Bulgaria. 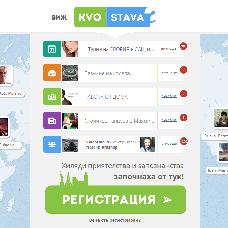 The main function of the KVO STAVA site is dating and sharing useful information among Bulgarians abroad. Originally the site was created only for Bulgarians in the USA. But its rapid spread among Bulgarians broke all limits. Now KVO STAVA is used by Bulgarians scattered all over the world.